Sharon is a senior partner at LaPadula Carlson + Co and is in charge of the firm's payroll compliance audit department and small business department. Sharon has over 30 years experience in public accounting and has been a partner in the firm since 1991. Sharon specializes in management advisory services including, but not limited to; budgeting projections and forecasting, tax planning and operations management. She is also in charge of special investigations in the forensic department. 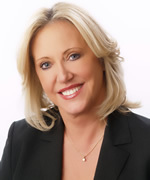 Sharon holds a Bachelors degree in Accounting from Barry University.